Home > MPC Touch Tutorials > MPC X & MPC Live: 6 Essential Tips & Shortcuts You Need To Know! MPC X & MPC Live: 6 Essential Tips & Shortcuts You Need To Know! Here’s 6 handy MPC X & MPC Live tips and shortcuts taken from my tutorial book, ‘The MPC X & MPC Live Bible’, guaranteed to speed up your standalone MPC workflow in no time! 1. If in doubt, reach for the SHIFT button! More accuracy: Hold down the SHIFT button while you turn the data wheel or Q-LINKS and the resolution of each dial ‘click’ is significantly improved. Get ‘0.1’ LEVEL increments in the CHANNEL MIXER, ‘TUNE’ in ‘0.01’ increments in SAMPLE EDIT, set the TEMPO via MAIN in 0.01 increments, change PROGRAM EDIT > LAYER OFFSET in single digits instead of 100s. There’s plenty more examples throughout the Touch UI; if you can’t set the value you want, SHIFT is normally the solution – if not double tap and you’ll either get a number pad or a larger on-screen dial/slider. Additional menu options: If you see a little upward arrow next to the first menu button on a screen, holding down SHIFT will produce a set of extra navigation buttons. 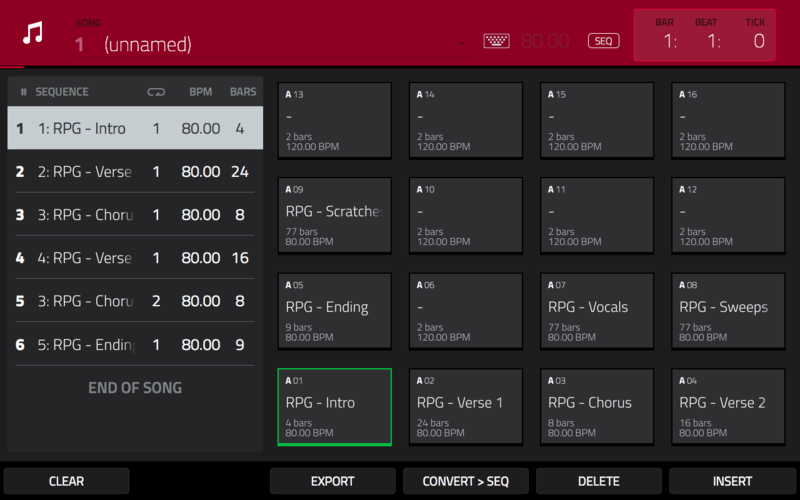 Currently you’ll find this in GRID, BROWSE, STEP EDIT, PAD PERFORM and SAMPLE EDIT (both in TRIM and CHOP). Additional Button Functionality: Hold down SHIFT to change the function of certain hardware buttons – the alternate functionality is literally written underneath the button. For example, SHIFT+UNDO = REDO, SHIFT + MENU = BROWSE, SHIFT + BANK A = BANK E. Remember you can also ‘double tap’ a button for the same result. Ever wondered why each pad in SONG MODE is assigned a sequence? First hit the REC transport button and now tap a pad and that sequence is automatically added to your song playlist. Keep on tapping those pads until you’ve quickly built your entire song, and if you need a sequence to repeat multiple times, just re-hit that pad for each required repeat. How easy was that? Need to lay an audio track across your entire song? Well you can’t do that in SONG MODE, so hit CONVERT>SEQ to convert your entire song into a long, single sequence. You can now record vocals and instruments to audio tracks that span the entire song/sequence, plus it makes mixing a doddle because while it’s not possible to tweak the CHANNEL MIXER in SONG MODE, you can freely adjust mixer settings while playing back a single sequence. MPC X owners get those lovely OLED displays above each Q-LINK to remind them of the current Q-LINK assignments, but all is not lost for MPC Live (and MPC Touch) owners. 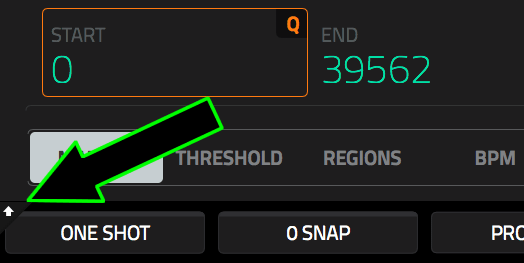 No matter what screen you are currently in, just press and hold down the Q-LINK button and you’ll be shown what the current Q-LINK assignments are. And if you do it in any of the ‘sequencing’ screens (e.g. 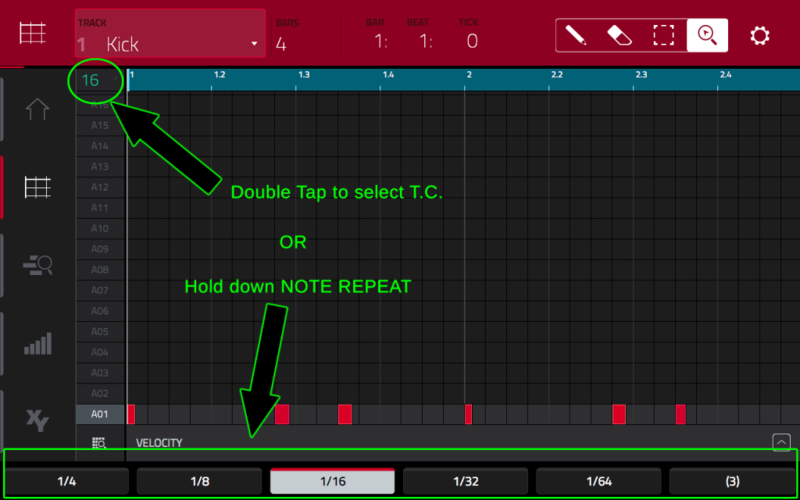 MAIN, GRID, STEP SEQUENCE, TRACK VIEW) you see there’s another quick option for changing T.C – the bottom Q-Link dial in Q-LINK column ‘1’. 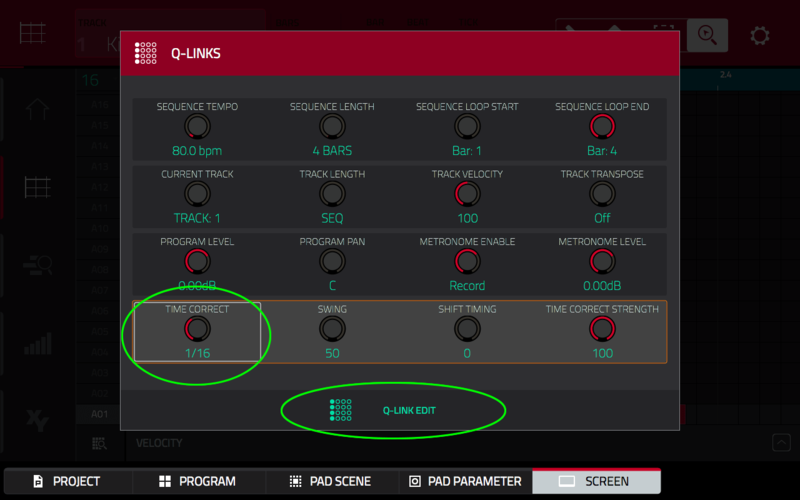 Remember you can also hit that Q-LINK EDIT button to set up your own custom Q-LINK assignments. Finally, this one is just a good old fashioned legacy MPC memory management tip. The MPC Live and MPC X have a finite amount of memory (much of the advertised 2GB RAM is used up on running the operating system) so don’t let your current project get too flabby with unused samples weighing it down. From MAIN, hit the folder icon in the top centre of screen to bring up the PROJECT panel (this gives you an overview of the resources in your project, as well as the option to save, export and create a new project). 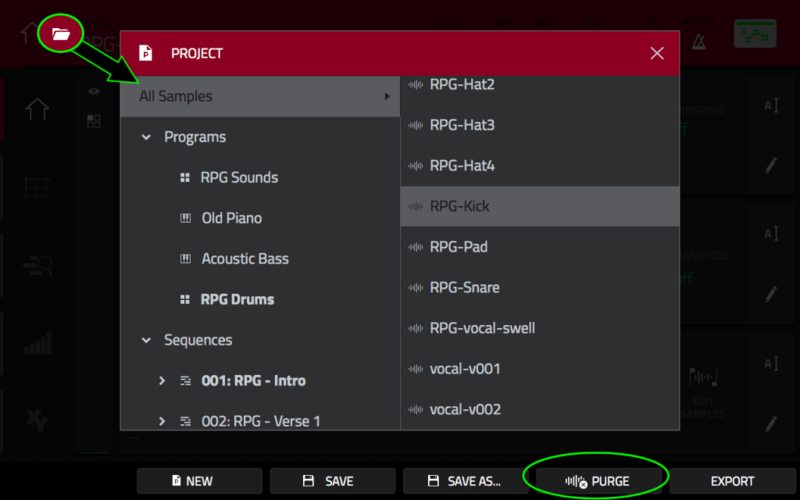 Hit the PURGE button and on the confirmation page select UNUSED SAMPLES; this will delete from memory any sample not currently assigned to a program, instantly freeing up some precious active memory. Other easy ways to save memory include making use of non-destructive chopping (i.e. chop to ‘slices’ and ‘pad parameters’) and using mono samples wherever possible (this will also help conserve CPU). 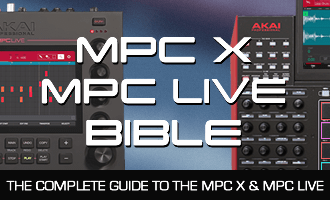 Discover more MPC Live & MPC X tips, tricks & tutorials in ‘The MPC X & MPC Live Bible‘.